WCLT - Nature Notes 3/8/2013 - What are seagulls doing in town? Adult ring-billed gulls have a black band on their bill and black wing tips, and a yellow bill and yellow feet. They are smaller than adult herring gulls, which lack the ring. Both kinds of gull frequent Westborough’s waters and parking lots, but ring-billed gulls are more numerous. What are seagulls doing in town? Westborough’s real estate is not exactly ocean front property, so what are seagulls doing in town? You see them sitting on the ice or floating on open water at Mill Pond, Lake Chauncy, or Sandra Pond. Or you might notice a gull soaring overhead. And then there are the gulls sunning themselves in the parking lots of businesses and fast-food restaurants along Route 9. Or hanging around dumpsters or the town dump. 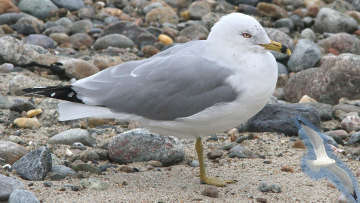 Most of the gulls we see in Westborough are ring-billed gulls (Larus delawarensis). They are known as inland gulls because they usually nest inland in freshwater areas, not along the ocean shore. The ring-billed gulls we see in town are generally on their way to or from inland nesting sites such as the Great Lakes and Lake Champlain regions. Most winter along the Atlantic coast from Rhode Island to Florida. Ring-billed gulls look pretty much like what most of us would consider a typical “seagull.” They’re white with a light gray back and wings, black wing tips, a yellow bill and yellow legs. As their name suggests, these gulls have a black ring near the end of their bill. They look quite similar to herring gulls (Larus argentatus), which also show up in town but in fewer numbers. One big difference is that ring-billed gulls are smaller than herring gulls. For example, ring-billed gulls are about 18 inches long with a 4-foot wingspan and weigh about a pound. Herring gulls are about 25 inches long, with an almost 5-foot wingspan and a weight of 2-1/2 pounds. A child who sees both kinds of gulls together in a parking lot might think that the ring-billed gulls are “baby gulls” because of the size difference. But you can point out that the smaller ring-billed gulls have a ring on their bill and the larger herring gulls don’t. Another difference is that herring gulls often have a bright red-orange spot on their bill. (Herring gull chicks peck at this spot to prompt a parent to feed them.) A less obvious difference is that ring-billed gulls have yellow legs but herring gulls have pink legs. Although they’re basically passing through town, ring-billed gulls are here for food. They’ve become very accustomed to getting food from human sources – reservoirs, landfills, sewage treatment plants, dumpsters, and people who drop food or deliberately feed them. These gulls eat fish, mice and voles (often in landfills), earthworms in plowed fields in the spring, insects such as grasshoppers, and of course, garbage. They also steal food from one another or from ducks or starlings. Ring-billed gulls typically feed in the morning and right before sunset, but they are intelligent and adaptable, so if a restaurant puts its garbage in a dumpster at mid-day, they’ll be there. How do gulls manage to stand on the ice for long periods of time? You’d think their webbed feet would freeze or make the gulls too cold. But this doesn’t happen, thanks to a special arrangement of blood vessels. Their feet and legs don’t need a lot of blood in any case, because they’re made mostly of bones, tendons, and scaly skin. A special arrangement of small blood vessels in the gulls’ body, near the top of the legs, conserves body heat. It sends heat from warm blood that’s heading for the legs to cold blood that’s returning from the legs. This “heat exchanger” allows the gulls’ body to stay normally warm while their feet get close to freezing. And like other birds, the gulls frequently stand on one leg and hold the other one up, next to the body, for warmth. You may have noticed that the gulls’ black wing tips look lovely on their long, graceful, pointed wings, shown in the inset in our photo. But are they good for anything besides decoration? It turns out that the black pigment makes feathers stronger, so the black wing tips resist the wear and tear of flight. For the breeding season, ring-billed gulls usually return to nest in the place where they hatched. Ring-billed gulls nest in colonies, unlike most of the birds that we see nesting in Westborough. There are no ring-billed gull colonies in central Massachusetts. Space is typically tight in the colonies, and nests are close together. The gulls make their nests on the ground on freshwater islands or shores. A pair defends a small territory of about 1-12 square yards. Both parents share the work of building the nest, sitting on the eggs, and feeding the chicks. Both female and male develop brood patches, which are areas of loose, bare skin on the breast which make it possible to warm eggs right next to the bird’s skin. Ring-billed gulls typically lay 3 eggs. When chicks hatch, they are downy and open their eyes within a day. They stay in the nest for about 4 days until they can walk. By about 5 weeks they can fly, and they usually leave the colony about 11 days after that. In the chaos of the crowded nesting colony, parents recognize their own chicks by sight, by the chicks’ facial markings. Chicks, on the other hand, recognize their own parents by voice and learn to imitate their parents’ calls. In a few cases, two female ring-billed gulls will nest together, caring for eggs from both in a single nest. Scientists think this happens when males are in short supply in a colony. How do ring-billed gulls manage to live in both saltwater and freshwater environments? Like other water birds, they have well developed salt glands that work as needed to remove excess salt from the gulls’ bloodstream. These glands are located above their eyes. The glands produce salty fluid that runs out through the nostrils and along the bill to the bill tip, where the gull simply flicks the droplet away. Gulls are among the birds that are known to play. Ring-billed gulls like to play a game of catch-and-drop, where they fly up with an object, drop it, and then swoop to catch it in their bill before it hits the ground. Young birds tend to play more than adults. Scientists regard this play as useful in improving skills used in capturing and handling prey. Ring-billed gull populations in the eastern U.S. have had dramatic ups and downs in the past. These gulls were abundant in the 1840s, but by the 1900s they had largely disappeared from the eastern U.S. Like many other water birds, they were overhunted for food and for their feathers, which were popular as decorations for ladies’ hats. Their numbers increased again after the federal Migratory Bird Treaty Act of 1918 protected them and most other birds. Then in the mid-20th century they were affected by the pesticide DDT and pollution from PCBs until regulations in the 1970s improved the environment. They are now abundant once again. Ring-billed gulls can be easy to find and fun to watch, but to prevent them from becoming pests, it’s important not to feed them. Their droppings can become a problem in places where the gulls congregate. For example, to keep their droppings from contaminating part of Boston’s water supply, the Mass Department of Conservation and Recreation (DCR) has a program to chase these gulls away from certain areas at nearby Wachusett Reservoir where they like to roost, or rest. If people don’t feed them, the gulls will still find food. They can also easily ride the winds and fly long distances.